The diagrams, it will be observed, are grouped under the seasons, and they indicate the positions of the constellations as they appear at 9 o'clock p.m. in mid-season. To facilitate finding and observing the constellations, the student should face in the direction indicated in the text. This applies to all constellations excepting those near the zenith. The four large plates are so arranged that the observer is supposed to be looking at the southern skies. By turning the plate about from left to right, the eastern, northern, and western skies are shown successively. On many of the diagrams the position of nebulæ is indicated. These are designated by the initial letter of the astronomer who catalogued them, preceded by his catalogue number, as for instance 8 M. signifies nebula number 8 in Messier's catalogue. 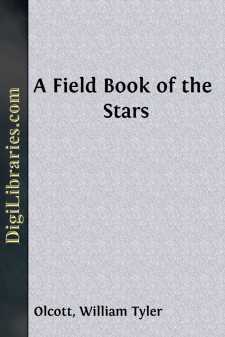 The magnitudes assigned to the stars in the diagrams are derived from the Harvard Photometry. When a star is midway between two magnitudes the numeral is underlined, thus 2, indicates a star of magnitude 2.5. If a star's magnitude is between 1 and 1.5 it is regarded as a first-magnitude star. If it lies between 1.5 and 2 it is designated second magnitude. Map showing the principal stars visible from Lat. 40° N. at 9 o'clock April 1st. Location.—Ursa Major is probably the best known of the constellations, and in this work I presuppose that the reader is familiar with its position in the heavens. It is one of the most noted and conspicuous constellations in the northern hemisphere, and is readily and unmistakably distinguished from all others by means of a remarkable cluster of seven bright stars in the northern heavens, forming what is familiarly termed "The Dipper." The stars α and β are called the pointers, because they always point toward the Pole Star, 28¾° distant from α.
Alioth is very nearly opposite Shedir in Cassiopeia, and at an equal distance from the Pole. The same can be said of Megres, in Ursa Major, and Caph, in Cassiopeia. The star ο is at the tip of the Bear's nose. A clearly defined semicircle begins at ο and ends in the pair ι and κ at the extremity of the Bear's right fore paw. This group of stars resembles a sickle. Note little Alcor close to Mizar. This star was used by the Arabs as a test of good eyesight. Mizar and Alcor are known as the horse and his rider. This plate shows the Bear lying on his back, his feet projected up the sky; three conspicuous pairs of stars represent three of his four feet. The Chaldean shepherds and the Iroquois Indians gave to this constellation the same name. The Egyptians called it "The Thigh." α and η are moving through space in a contrary direction to the remaining five stars in "The Dipper." Location.—The two pointer stars in Ursa Major indicate the position of Polaris, the North Star, which represents the tip of the tail of the Little Bear, and the end of the handle of the "Little Dipper." In all ages of the world, Ursa Minor has been more universally observed and more carefully noticed than any other constellation, on account of the importance of the North Star. Polaris is a little more than 1¼° from the true pole. Its light takes fifty years to reach us. A line joining β Cassiopeiæ, and Megres, in Ursa Major, will pass through Polaris. At the distance of the nearest fixed star our sun would shine as a star no brighter than Polaris which is presumably about the sun's size. Polaris revolves around the true pole once in twenty-four hours in a little circle 2½° in diameter. Within this circle two hundred stars have been photographed. The North Star is always elevated as many degrees above the horizon as the observer is north of the equator. Compare the light of the four stars forming the bowl of the "Little Dipper," as they are each of a different magnitude. A standard first-magnitude star is 2½ times brighter than a standard second magnitude star, etc.